After killing 230 couriers over 2 week period I finally got the ring. I killed 4 glowing couriers before I got the 5th to drop the ring. The other 4 had defiant gear on them. I don't know if the defiant gear affects the drop rate or not. I will never hunt for this item again. There are 5 spawn points for the courier and I was able to keep all 5 spawn cycles cleared. This is a very long camp and if I had to do it all over again I would have 18-22 level alt accounts with a merc tank covering each spawn point while clearing all wandering mobs with a tracking toon. I got all 5 couriers to spawn by swarming all the wandering mobs from lake to windmill to undead ruins to lake (think of it as 1 big square) and by keeping them cleared was able to get the 5 couriers to spawn consistently. Problems were some mobs; mostly the cats and lower level skels, would get stuck in the lake or graphically get stuck in the mountain and interrupt spawn cycles. Followed Limecherry's guide and finally got the ring to fall this morning. Approximately 60 couriers. Wow, I've been playing this game "forever" and I never realize that ANY invis spell breaks charm? Is that right? Clicking this would break charm on a non-animal charmed by an enchanter, bard or necro? Can anyone confirm from experience? Yes, it worked for my bard on Fippy. After 5 days, up to 4 hours on the weekend days, the wonderful, brilliantly glowing Sarnak Courier finally appeared. I hope I never have to go back!!! Note: not all of the posted cycles include the Sabretooth Tigress. She is perhaps the rarest member of the cycle, but she is definitely a part of it. Good luck! I just got the ring to drop from the Sarnak Courier after about 6 hours of camping. Killing the mobs in the cycle is definitely the way to do it, although I was flabbergasted when the courier did, in fact, drop the ring because he did NOT glow as I expected. Here's the strategy. I'm a level 75 enchanter, but it should be pretty trivial for most anyone. 2) Go to the field just north of windmill in loio. 3) Kill everything that moves in between windmill and goblin ruins. Mobs tend to have about 400 hp. I soe'd pet with druid, and just used level 2 tash to aggro whole loads of them, ran around, and pet took care of the rest. Be warned that the courier will fight any goblins he comes across, and he's a wussy. So if you see a gob and sarnak fighting, just quick nuke the gobby and once he's dead the sarnak's all yours. Got mine in about an hour. Very nice to have. the mob cycle listed below it not really a cycle, the mobs seem to pop in any order so if you're high enough to do so, general all around killing works fine. With my druid I can track them so it's a little easier of course. And a couple of the mobs do get in fights with other mobs so your mob can be killed if you just stand around so it's best to just keep running around killing and pay attention to two of the sarnaks killing each other. Usually it's one of the conscripts. The courier has popped for me twice now and each time he's had the hand. He was by the buildings in the ruins once and the other time near the hills to the east of the ruins. I wasn't entirely sure as to whether or not the courier would glow if the Gazughi Ring was on him, but I can confirm it - he does indeed. I created my Allakhazam account to post this information! The ring is actually a very powerful light source. It is VERY noticeable - you will know if he's your man or not once you see him (at least at night time). It took roughly 35 couriers and eight or nine hours to get my ring. This was many hours of killing, killing, tracking, and more killing. Also, don't get too excited if you kill him and he drops a ring. It could be the Spirit Caller which is a very bad ring but is quite rare as well (I got two of these in my time camping him). 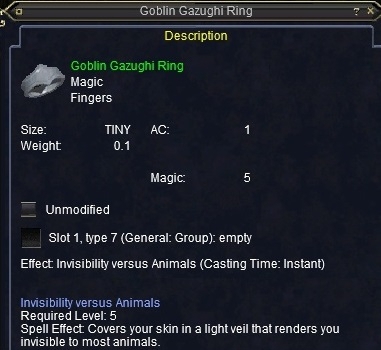 If he's not glowing, it is not the Gazughi Ring. Best of luck - keep at it and you shall be rewarded. Was just wondering when the last time anybody got one of these? I've killed approximately 70 couriers with no ring drop and am wondering if it still drops. Just looted one yesterday when I was running through the zone on a task and saw courier on track. Why does this sell for so much? Kill em all, let Cazic-Thule sort them out!! Because any invis spell breaks all charm spells. In other words, for enchanters and druids and necros, this is a quick way to break charm on a charmed pet, without having to mem invis. And yes, even for non-animals, invis to animals breaks charm. I can verify this does still drop and believe me in following the spawn cycle with my ranger this drop is rare. I Camped this clown 8 hours for my wifes Cleric. Killed too many to count and looted every thing from this guys loot table from the belt to the cape, the skull looking ring and finally, FINALLY one Clickie Ring, so it is still working. I think this guy is worse than camping Grachnist for the stupid clickie earring!! Ring dropped for me today September 9th, 2004 after three days camped and many courier kills. I knew he had it before I killed him (though I didnt believe it till I looted it) because he was giving off light, kinda like a willowisp in the distance. This just dropped for me this morning. About 12 hours total, with about 30 couriers killed. You don't have to have track to do this, just have the visibility slidebar set to 100% and keep targeting the mobs from a distance (Not as fast as tracking, but the ph's are all within a close distance). The cycle does work, with the periodical tigress massacre to reset some of them. I've had up to 4 cycles going. The courier is on the cycle, his death triggers another courier or the next cycle mob. Also, the ring does give off light as I could tell right away the courier had it on em from a distance. 'Cycle' in this sense just means a group of mobs that can spawn when the previous mob in said group dies. I just got mine yesterday (41 bard on Maelin) after 76 kills and roughly 24 real life hours camping (over a week). I had a few occaisions where killing the courier spawned another right after. The respawn time of any mob in the 'cycle' is about 3 seconds. Got one yesterday 06-08-2004. Just running thru LOIO and saw a Courier and dropped a ring. I camped this today for about 90 minutes. I got the ring with my bard on the 3rd courier spawn. All I did was kill everything between the windmill and the goblin ruins by the river. Finally got after many hours of spawning the Courier. (~12hrs) Limecherry is right on about the spawn cycle and PHs.. (thanX) Worth the time, unless you have ~18K on Tallon. Blauelied 54 years of singing in the Tallon Choir. I will not hear a word you say. I got one to drop on may 7, 04 on Bertox. It took about 20 total hours of making Couriers spawn. This was so annoying to get, I wouldn't sell it for 100k. The courier wasn't glowing, but after the dx9 patch you can't trust what you see. One strange thing was that the Courier that died before this spawn had a goblin skinner 1hs. The lord of darkness reigns! Ok, I dont believe this guy for a second. Can anyone confirm if this still drops? Spent 15 hours killing courier and haven't seen it yet. Some think it was taken off the loot table during GOD expansion. I can confirm that his claims are *possible*, not a guaranteed 2 a night, but yesterday in 13 hours of camping, I got 3 rings, so it is possible. However, today, I havent seen a single one. "Subtlety is the key to most victories." There are 4 cycles for this mob 3 spawn between teh windmill and the ruins. Another spawns near the sarnak fort (Confirmed by tracking). Being that it is a instaclick invis, even if vs animals, this is perfect for a swarm kiting bard. Casting any kind of invis on a bard breaks the charm. Plenty of discussion (by Bards for Bards) on EQDiva. Does this still drop (Feb 2004)? Is is usable out of inventory, or does it have to be equipped? The screenshot seems to be rather old, which is why I am asking. Thanks in advance. Edit: NM, just looked it up on Lucy and it says "Must Equip". Sigh, at least that saves me some camping, looking for out of inventory clicker.